If you are interested in these porcelain figurines - please click here. 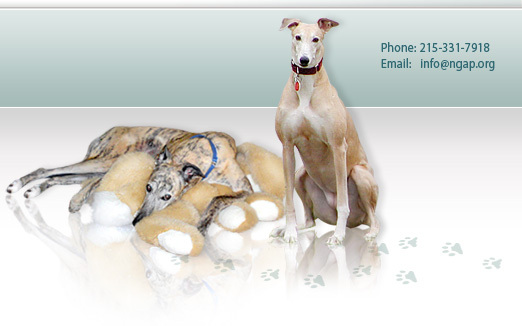 Collectible Figurines: Lenox Porcelain Greyhounds. Whether you own greyhounds or not, greyhound lovers will want this pair of Lenox Collectible Figurines, which comes in a distinctive Lenox packaging and includes a certificate of Hallmark as well as lifetime breakage replacement registration. This exclusive porcelain work of art is part of a great American tradition of enduring beauty and the finest craftsmanship. This exquisite sculpture bears the Lenox hallmark and conforms to the Lenox Classics high standart of quality. 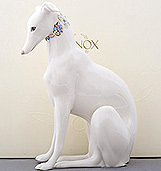 These quality Lenox figurines, made of ivory fine porcelain and elegantly accented with 24-karat gold and fully-leaded crystal gemstones, are a graceful homage to the greyhound. Long honored for their devotion and beauty, they are here represented with the fine craftsmanship that they deserve. The pair -just like greyhounds should be! 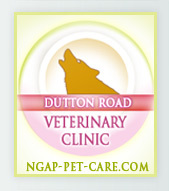 - come with one seated dog and one handsomely reposed. They touch noses when displayed together and both wear collars of delicate gold drops and gemstones. Tails classically pegged to the well sculpted bodies, the porcelain sculptures exude a purity and magnificence that define the greyhound. 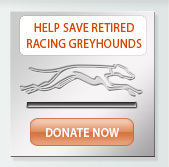 It's no wonder everyone from Cleopatra to Odysseus and Alexander the Great owned greyhounds! The small porcelain statues make a great gift for any dog lover or anyone interested in Lenox collectibles, as well as dog figurine collectors. Display them separately or together; the refined, white porcelain figurines will glow in any setting and complement other Lenox porcelain, as well. 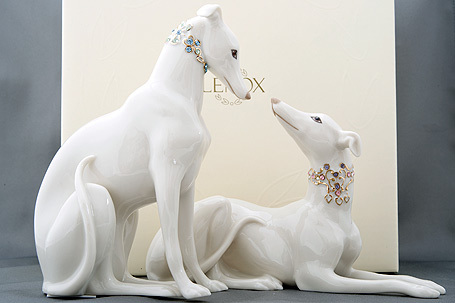 This particular pair of greyhound figurines - Lenox Limited Edition porcelain called Jeweled Devotion - are available only through National Greyhound Adoption Program. Dust your porcelain figurine collectibles regularly by blowing or brushing dust off gently. Make sure that the dusting tool that you choose is gentle and lightweight, such as a feather duster, chamois or soft-bristled paint brush. Brushes tend to work best for removing dust particles from fine crevices and creases. Hand wash fine porcelain using a mild soap when necessary. Run the figurine under warm water, gently rub stained areas with a soft cloth, and rinse. Place the figurines on a paper towel and allow them to air dry. Be sure to protect the area with towels or rubber mats, just in case one happens to slip and fall. Scrub your porcelain figurines only if there are tough stains, and then only on the stained area with a damp washcloth. For the toughest stains, the figurines may be submerged in warm water for a few seconds, but use extreme care as the delicate surfaces can be easily damaged by scrubbing. If the stain is not easily removed, ask yourself if it is worth the risk. Never use common cleaning supplies such as scrubbing pads or toothbrushes as they can easily damage the porecelain's delicate enamel. Use cleaning solutions with extreme caution. Read the label of the product carefully, to determine whether it can be safely used to clean porcelain. Test a small, inconspicuous section of the figurine first and always follow the directions on the package. While china tableware is dishwasher safe, never place porcelain figurines in the dishwasher, as they are far more delicate than china. Keep your porcelain collectibles behind glass, that will prevent them from collecting a lot of dust, so that you would not have to clean your figurines too often, reducing the risk of the fine porcelain surface being damaged.